A mathematical proof should resemble a simple and clear-cut constellation, not a scattered cluster in the Milky Way. In A Mathematician’s Apology (1940, 2012), 113. All the old constellations had gone from the sky, however: that slow movement which is imperceptible in a hundred human lifetimes, had long since rearranged them in unfamiliar groupings. But the Milky Way, it seemed to me, was still the same tattered streamer of star-dust as of yore. In The Time Machine (1898), 144. Historically [chemistry] arose from a constellation of interests: the empirically based technologies of early metallurgists, brewers, dyers, tanners, calciners and pharmacists; the speculative Greek philosphers' concern whether brute matter was invariant or transformable; the alchemists' real or symbolic attempts to achieve the transmutation of base metals into gold; and the iatrochemists' interst in the chemistry and pathology of animal and human functions. Partly because of the sheer complexity of chemical phenomena, the absence of criteria and standards of purity, and uncertainty over the definition of elements ... but above all because of the lack of a concept of the gaseous state of matter, chemistry remained a rambling, puzzling and chaotic area of natural philosophy until the middle of the eighteenth century. The Chemical Tree: A History of Chemistry (2000), xxii. I raised the visor on my helmet cover and looked out to try to identify constellations. As I looked out into space, I was overwhelmed by the darkness. I felt the flesh crawl on my back and the hair rise on my neck. In How Do You Go To The Bathroom In Space? : All the Answers to All the Questions You Have About Living in Space (1999), 118. In space there are countless constellations, suns and planets; we see only the suns because they give light; the planets remain invisible, for they are small and dark. There are also numberless earths circling around their suns, no worse and no less than this globe of ours. For no reasonable mind can assume that heavenly bodies that may be far more magnificent than ours would not bear upon them creatures similar or even superior to those upon our human earth. As quoted in Dave Goldberg, The Universe in the Rearview Mirror: How Hidden Symmetries Shape Reality (2013), 74. In the next twenty centuries … humanity may begin to understand its most baffling mystery—where are we going? The earth is, in fact, traveling many thousands of miles per hour in the direction of the constellation Hercules—to some unknown destination in the cosmos. Man must understand his universe in order to understand his destiny. Mystery, however, is a very necessary ingredient in our lives. Mystery creates wonder and wonder is the basis for man’s desire to understand. Who knows what mysteries will be solved in our lifetime, and what new riddles will become the challenge of the new generation? Science has not mastered prophesy. We predict too much for the next year yet far too little for the next ten. Responding to challenges is one of democracy’s great strengths. Our successes in space can be used in the next decade in the solution of many of our planet’s problems. In a speech to a Joint Meeting of the Two Houses of Congress to Receive the Apollo 11 Astronauts (16 Sep 1969), in the Congressional Record. It has always irked me as improper that there are still so many people for whom the sky is no more than a mass of random points of light. I do not see why we should recognize a house, a tree, or a flower here below and not, for example, the red Arcturus up there in the heavens as it hangs from its constellation Bootes, like a basket hanging from a balloon. As quoted in J. L. Locher, Escher: With a Complete Catalogue of the Graphic Works (1982), 113. From White House Announcement of the Completion of the First Survey of the Entire Human Genome Project, broadcast on the day of the publication of the first draft of the human genome. 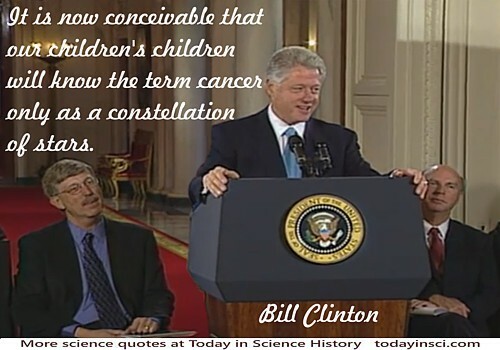 Quoted in transcript on the National Archives, Clinton White House web site, 'Text of Remarks on the Completion of the First Survey of the Entire Human Genome Project' (26 Jun 2000). And wondered at the mystery of it all. In 'Tycho Brahe', The Torch-Bearers: Watchers of the Sky (1922), Vol. 1, 40. One summer night, out on a flat headland, all but surrounded by the waters of the bay, the horizons were remote and distant rims on the edge of space. Millions of stars blazed in darkness, and on the far shore a few lights burned in cottages. Otherwise there was no reminder of human life. My companion and I were alone with the stars: the misty river of the Milky Way flowing across the sky, the patterns of the constellations standing out bright and clear, a blazing planet low on the horizon. It occurred to me that if this were a sight that could be seen only once in a century, this little headland would be thronged with spectators. But it can be seen many scores of nights in any year, and so the lights burned in the cottages and the inhabitants probably gave not a thought to the beauty overhead; and because they could see it almost any night, perhaps they never will. In The Sense of Wonder (1956), as condensed in Reader’s Digest (1986), 129, 174. Her constellations come, and climb the heavens, and go. Poem, 'Hymn to the North Star', collected in Poems by William Cullen Bryant: Collected and Arranged by Himself (1873), 84. The Sun is no lonelier than its neighbors; indeed, it is a very common-place star,—dwarfish, though not minute,—like hundreds, nay thousands, of others. By accident the brighter component of Alpha Centauri (which is double) is almost the Sun's twin in brightness, mass, and size. Could this Earth be transported to its vicinity by some supernatural power, and set revolving about it, at a little less than a hundred million miles' distance, the star would heat and light the world just as the Sun does, and life and civilization might go on with no radical change. The Milky Way would girdle the heavens as before; some of our familiar constellations, such as Orion, would be little changed, though others would be greatly altered by the shifting of the nearer stars. An unfamiliar brilliant star, between Cassiopeia and Perseus would be—the Sun. Looking back at it with our telescopes, we could photograph its spectrum, observe its motion among the stars, and convince ourselves that it was the same old Sun; but what had happened to the rest of our planetary system we would not know. The Solar System and its Origin (1935), 2-3. The word “universe” means the general assemblage of all nature, and it also means the heaven that is made up of the constellations and the courses of the stars. In De Architectura, Book 9, Chap 1, Sec. 2. As translated in Morris Hicky Morgan (trans. ), Vitruvius: The Ten Books on Architecture (1914), 257. We see a universe marvelously arranged and obeying certain laws, but only dimly understand these laws. Our limited minds cannot grasp the mysterious force that moves the constellations. I am fascinated by Spinoza’s pantheism, but admire even more his contributions to modern thought because he is the first philosopher to deal with the soul and the body as one, not two separate things. With every passing hour our solar system comes forty-three thousand miles closer to globular cluster 13 in the constellation Hercules, and still there are some misfits who continue to insist that there is no such thing as progress.